Turn into Governor’s Ridge and continue away from Powers Ferry Road. Our building is Number 14 and it is located in the center of the park. Numbers are on the sides of the building and on sign posts in front of the building. The entrance to the clinic is facing the back of the park. Take I-75 South to the 280 / Lockheed Exit (2 exits north of I-285). Turn left onto Delk Road. 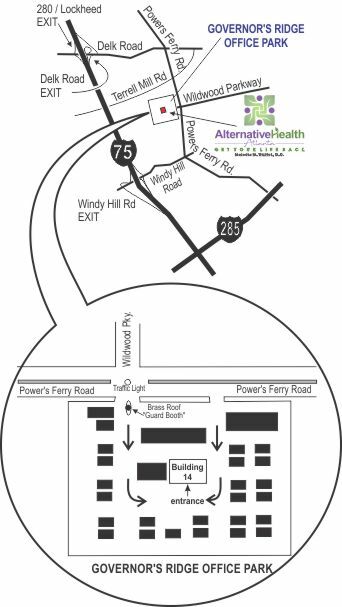 Take Delk Road to Power’s Ferry Rd SE. [1.0 mi.]. Turn right on Powers Ferry Rd SE. Turn right into Governor’s Ridge [0.6 mi.]. (If on I-285, get off on I-75 North.) Take I-75 North, get off on Delk Road (2nd exit North on I-75 from I-285 Interchange), stay in the right hand exit lane (turn right on Delk Road). Take Delk Road to Powers Ferry Rd SE. [1.0 mi.]. Turn right on Powers Ferry Rd SE. Turn right into Governor’s Ridge [0.6 mi.]. (770) 937-9226 if you have any difficulty with emailing an attachment. Note to New Patient and Workshop Attendees: Workshops and New Patient Appointments may be at other times than shown above.